Monsoon-Triggered Mudslides, Floods In Sri Lanka Kill More Than 90 People : The Two-Way Evacuations are underway, with helicopters and boats trying to reach stranded communities. More than 100 more people are missing, the country's disaster management center says. 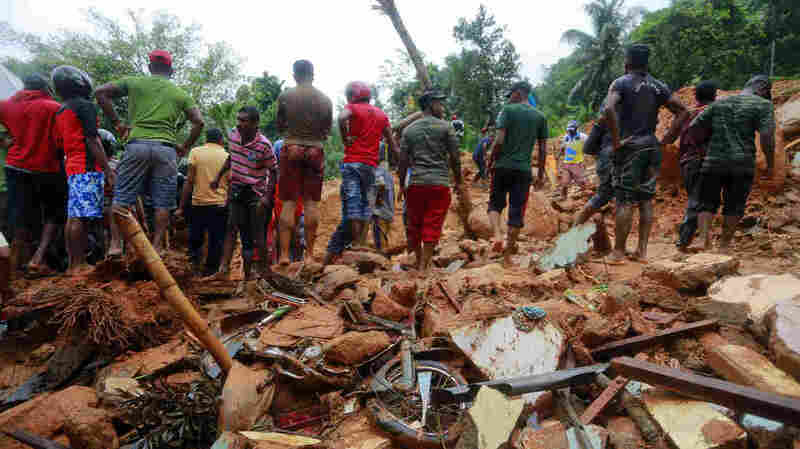 Sri Lankan military rescuers and villagers stand on the debris of a house that was destroyed in a landslide in the village of Bellana, in the Kalutara district of Sri Lanka, on Friday. Mudslides and floods triggered by heavy monsoon rains have killed scores of people in the island nation. Heavy rains in Sri Lanka have prompted devastating mudslides and flooding, killing at least 91 people and leaving more than 100 missing, according to authorities. Search and rescue operations are currently underway, the Sri Lankan Disaster Management Center says. "Deputy Minister for Disaster Management Dunesh Kankanda said many people were on roofs and treetops calling for help. "Many homes and roads were inundated. Schools were closed in the province of Sabaragamuwa, about 90 kilometers (55 miles) east of Colombo. "Aid groups, rescuers and other government workers were ordered to cancel any holidays and remain on alert for the next three days." 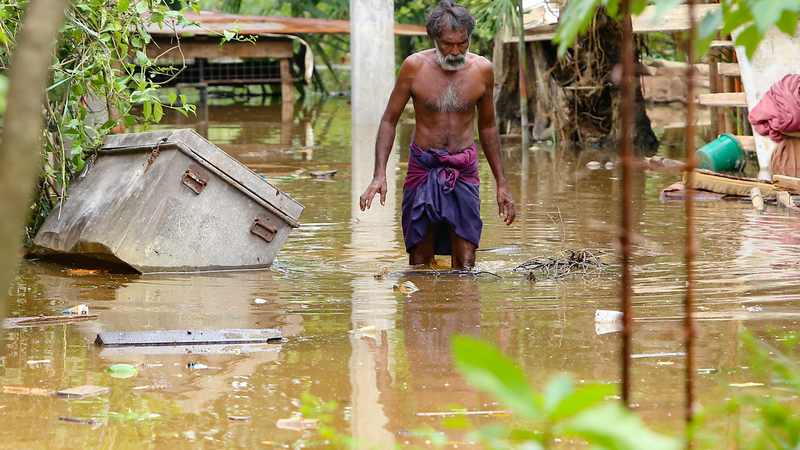 A year ago, torrential rains in Sri Lanka triggered landslides that buried three villages. The mud was 30 feet deep in some areas, one rescue operator told Reuters at the time. That disaster killed more than 100 people and completely destroyed more than 500 houses, AFP reported. Sri Lanka's southwest monsoon season runs from May to September. But Reuters reports that recent rainfall has been unusually heavy, even for this rainy period. "Sri Lankan meteorology officials said Thursday's rains are the worst since 2003," the wire service says. And the AP notes that the region is increasingly vulnerable to rain-triggered landslides. "Mudslides have become common during the monsoon season in the tropical Indian Ocean island as land has been heavily deforested to grow export crops such as tea and rubber," the news service writes. A Sri Lankan man walks through floodwaters in Kaduwela, Sri Lanka, on Friday. More than 90 people were reported dead after unusually heavy rains triggered floods and mudslides in Sri Lanka.